Von’s Bookstore has grown beyond comprehension. A few weeks ago, I visited West Lafayette, Indiana, where I went to Purdue for, um, well, quite a while. I hadn’t seen the place for nearly 20 years, and it was a nostalgia trip for me. Of course, I was well aware that Purdue had grown and metastasized enormously since then, but I hoped I would still find some recognizable haunts. As it turned out, just getting to it through the maze-like slalom of road construction was a challenge, but I met it and prevailed without recognizing a single intervening intersection, and parked my car on a side street in front of a brick apartment building where a house a friend had lived in had stood. Purdue was different, to say the least. New buildings were everywhere. On a corner near the old armory where once stood the Black and Gold Grille, affectionately know by countless generations as the Barf and Gag, there was an imposing brick structure with a limestone façade. In the campus center, parking lots had been converted to park-like malls by dumping great lumps of dirt at intervals and planting trees and grass thereon. The old mall that I knew, lined with the oldest buildings (Purdue Hall, the Recitation Building, Stanley Coulter Annex), was now crisscrossed by concrete paths. Students had long, long since begun to ignore the orders to stay off the grass, barked by senior ROTC watchdogs. In fact, the ROTC itself had become declassee by the late 60s, after my first lovely and eternally-enshrined-in-memory two-year academic debacle forced me to take a hiatus. Incredibly, lining the mall at the North end were temporary stalls selling everything from beets to baklava. It was a farmer’s market, which I discovered happened every first Thursday. The old admins would have paled at the sacrilege. Everywhere there were crowds of young people being shepherded around by guides, only slightly older, but invested with all the wisdom conferred by an entire year or two as students. It must have been orientation day, or week. The guides held books, umbrellas, whatever came to hand, high in the air, the better to be followed, as they barked their well-rehearsed comments on the sights about them. They looked for all the world like tour guides in any of the great European cities. The old Student Union was still there, proud and hale, impervious to the modernizations thrust upon it. In spite of everything, it felt oddly familiar, perhaps because of the couches in the long commons on the second floor, where students and faculty still dozed obliviously. A small room at the East entrance, which had held a stereo system and a library of classical music (a refuge I availed myself of more than occasionally), was now a Welcome Center, manned, or, I should say, peopled, by three smiling young women. They listened patiently as I explained how often I had sat there listening to Bruch or Scriabin, indelible smiles imperviously aglow. They no doubt wondered what kind of music those bands played. The only hint of a crack in their relentless cheerfulness was after I told them that the old couches in the commons were still doubtless rich with my DNA from my having collapsed so often there in a drunken swoon. I left after having a greasy burger in the East room of the Sweet Shop, the only recognizable piece remaining of that venerable institution. How often had we languished in delicious despair in those booths! But to get to V-Mart, which, after all, is the title of this reverie. In the little village area East of campus (now a rather large tumor) much stays the same, though much has changed. The University Bookstore still hugs the corner, and Follett’s University Empire is nearby, but across the street next to the venerable Harry’s Chocolate Shop, Deac’s is gone, but that’s fine. It’s space has been taken over by Von’s Shops, a phenomenon wholly of my personal era at Purdue. In 1965 or 66, I heard that an English grad student, despairing of finding much worth reading at the existing bookstores, had opened a small one, selling books out of the living room of the house he was renting. I decided to check it out. It was – I hate to use the word, but it’s appropriate – awesome. Not awesome like the new bacon cheeseburger at MacGreasy’s, but awesome like a forest glade, or the sea in autumn. Yes, all that, in the living room of a rented house. There was nowhere to look in that room without seeing books, books upon books, in every cranny, on ledges; no horizontal surface was spared. In no time I had gathered an armful of books, and walked up to the table by the door where Jon Von (he surely has a longer name, but no one seems to know it) sat collecting money. I had one minor problem: I was broke. “Can I get these on credit?” I asked. I stood, deflated for a moment, then ventured, “Can I be a regular customer?” It was meant only half seriously, as a joke, but Jon said, “Sure!” and made out an IOU on the spot. That was it, I was addicted, and remained a loyal customer from that moment on. 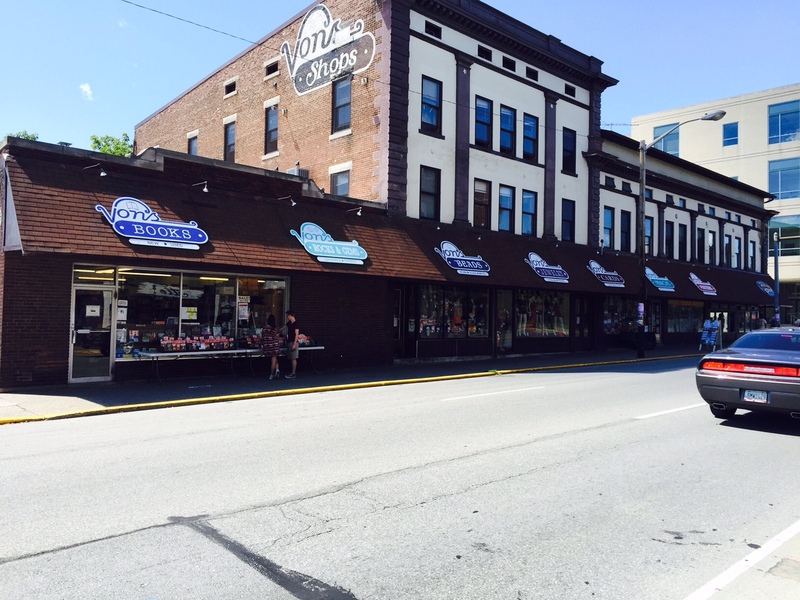 Later, after a hiatus of five years, I went back to school at Purdue, and discovered that Von’s had moved up in the world, and occupied a tiny storefront, the leftmost shop in the photo, just like a real bookstore. I went in, and was instantly relieved to find the same critical mass of reading material, now much enlarged thanks to the greater accommodations, but otherwise unchanged in spirit. Jon still ran the place, now with an associate, Jim, whose surname I unfortunately can’t bring to mind. Jon remembered me, and I immediately resumed my tab. I have to say a few words about that tab. It was, in my mind, a lifeline, a connection to a universe of literature I would probably never have encountered otherwise. Von’s was, and still is, the kind of bookstore where it’s best to go in with nothing in particular in mind, and wander about aimlessly. You will invariably leave with some books, most by authors you had never heard of before. It was in just such a way I discovered Milan Kundera, Italo Calvino, Kobo Abe, Chinua Achebe, and a long list of others. I cherished that tab. I paid on it regularly, but always left a charge of something under $50, just to maintain a connection, even long after I graduated and left for good, coming back increasingly rarely. I finally paid it off in full (I think!) when it became clear that the gaps were getting too long to maintain the fiction that I was a regular. I don’t know what Jon thought of this curious habit. It must have been at least annoying to a small businessman like him, but he never said anything, and it was on my own initiative that I paid it off, out of a sense of guilt that I was taking advantage of a generous person. Over the years, the store grew. By and by, the space next door was annexed for a record shop, the second of Von’s Shops, and we started joking about V-Mart when a K-Mart down on the levee went out of business. Little did we know. Von’s Shops eventually expanded into the entire block, selling records, beads, T shirts, and all manner of odd merchandise. But the corner remains the bookstore, no different, and apparently immortal. I went in on my recent visit, and was delighted to see that not only was the mass of books still lining shelves so close that you have to move sideways between them in places, but beyond all expectation, Jim was still there, behind the same unchanged counter piled with paper. Stranger still, he looked much the same, unaged except for perhaps a touch of transparency. I wondered if he had a painting tucked away in an attic. I said hello, and so did he, looking at me expectantly, as if I had just been there the day before, and had some request, perhaps a book I wanted to order. We talked; I asked about Jon. Yes, he still worked the counter, Jim informed me, a bit incredulously, I thought, at the idea that he wouldn’t, but he was at lunch at the moment. I looked around the shelves, and left with five new books, which seemed to have attached themselves to me in much the same way burrs do on hikes in the countryside. I briefly considered putting them on my tab, which I am convinced still exists, on a 3X5 card in a file box still gathering dust somewhere. In the end, I paid up, and took my treasures across the street to the Vienna Coffee Shop. Things do change, even the apparently immutable.